Bangladesh Textile Mills Corporation: BTMC Job Circular, Application Form & Result 2017. Bangladesh Textile Mills Corporation (BTMC) Job Circular & Result are found here www btmc gov bd. The Recruitment all Information of Bangladesh Textile Mills Corporation Collect from our Website teletalkbangladesh.com. Bangladesh Textile Mills Corporation job circular & Apply instruction 2017. BTMC job circular 2017 for the various post as well under all the Mils over the country and for Head office. Original Bangladeshi candidates are requested to apply. 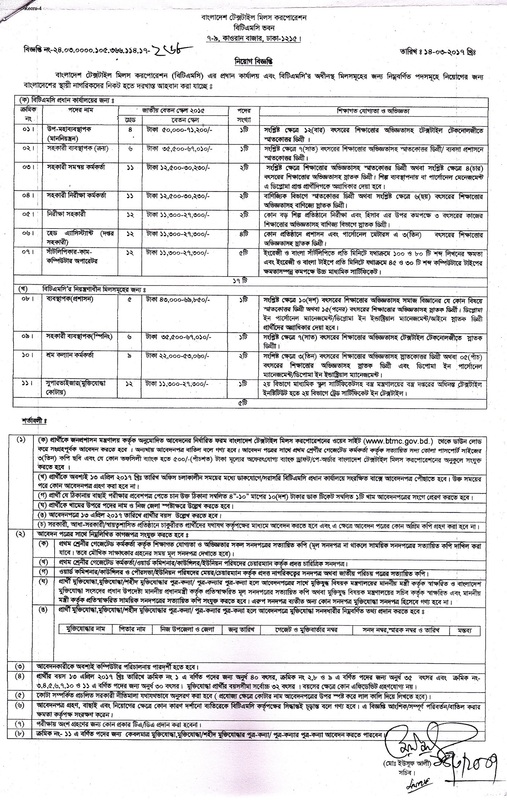 The BTMC job circular has published on Bangladesh Pratidin Newspaper and their official website at www btmc gov bd. Bellow, you have to see the details of this job. Interested candidates must apply by the Ministry of Administration prescribed Application Form. They can download it from www btmc gov bd. Should be attached three copies passport size color photograph and 500 Taka Bank draft copy. Candidates must send their application form by 13 April 2017 to BTMC via postal or Currier service. After due time no application will acceptable. Candidates must write Post Name and District Name on the envelop. Mention their Age up to 13 April 2017 on Application Form. All the educational certificate photocopies. Candidates must know computer operating. They will face Written exam and viva voce. There will no pay anything like TA/DA for the interview. Here we will update Bangladesh Textile Mils Corporation job circular 2017. BTMC job written exam result and viva result as well via www btmc gov bd. For next update others information, keep in touch on this article. BTMC Job Circular, Application Form & Result 2017. Bangladesh Textile Mills Corporation (BTMC) Job Circular & Result are found here www btmc gov bd.